John Lennon's widow Yoko Ono is marking the 28th anniversary of the musician's death by playing a special memorial concert in Tokyo. 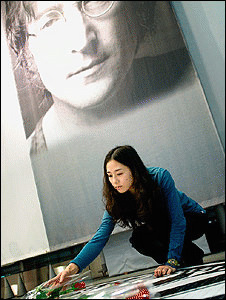 Japan is one country where John Lennon's memory is kept very much alive. Beatlemania has never really died. 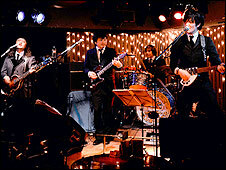 Every night in Tokyo, bands dressed as John, Paul, George and Ringo faithfully reproduce their sound. Even though many of the musicians would struggle to hold a conversation in English, they know every word of the entire Beatles songbook. Fans of all ages sing along, but only the older generation can remember the momentous occasion when the Beatles performed in Japan. They played Tokyo's Budokan Arena for five nights in the summer of 1966, with each show lasting just thirty minutes. Thirty-five thousand policemen guarded the group from their fans and from nationalist protestors who threatened to disrupt the concerts. They believed a foreign pop group would "desecrate" a hall which had been built for judo and other "noble" martial arts. In the end, the concerts passed without incident, but Yoko Ono says that later, Lennon looked back on the experience with bemusement. "The Beatles were a little bit concerned because the people were rather quiet, so they thought maybe the people didn't like it," she explains. "But then the organiser explained that the Japanese are very polite and they do not want to scream and shout - they just want to applaud. "In those days it was like that, but now, of course, the Japanese fans have learned to be expressive," says Ono. The Beatles' 1966 Tokyo shows were part of a gruelling world tour to promote their records and, of course, to make money. However, they also became unofficial diplomats for Britain - a point noted by the then British ambassador to Tokyo, Michael Stewart. "In sober truth, no recent event connected with the UK - apart from the sole exception of the British Exhibition of 1965 - has made a comparable impact on Tokyo," he wrote in a confidential memo. 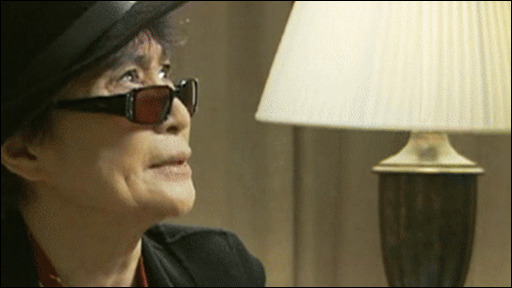 He also praised the Beatles' skill in handling the Japanese media at a press conference. "Most commentators accepted them for what indeed they are - agreeable, talented and quick-witted young musicians," wrote the ambassador. Junichi Mizusawa, who runs the John Lennon museum in Saitama, says the Beatles received such a warm welcome because they represented the chance for a fresh start. "We really felt that they were singing for us. They sounded completely different to Japanese music or jazz or American pop, so initially it was rather shocking," he explains. "But young people in the 60s had no problems accepting them because they seemed to be giving voice to our feelings. It was a new sound that excited a generation which had nothing to do with the war." After he married Ono in 1969, John became a frequent visitor to Japan and even tried to learn the language. He treasured the fact that the Japanese rarely intruded upon him and his family. Since his murder on 8 December 1980, Yoko has worked tirelessly to maintain Lennon's image as a music icon and peace campaigner. Now at the age of 75, she's back in Japan for an anniversary concert at the same venue where the Beatles played their legendary shows. "Now I'm getting philosophical about it, I think that my ancestors, the spirit of my ancestors, is calling to me saying, 'Yoko, you should come back to Japan once in a while.' So I'm now saying okay." Ono explains she has always been sensitive to spirits and feels her husband's presence keenly when she is in her home country. "He loved Japan so much. I don't think it was to do with his wife - well maybe a little bit! "But he liked the sensitivity and the quietness that the Japanese have and the reason is because he was a shy person. "I'm sure you don't think that he was a shy person but he was, and he related to that I think." Ono's concert at the Budokan will raise money to build schools in Asia and Africa, and will also feature Japanese artists such as Tortoise Matsumoto and Bonnie Pink. Some fans of John Lennon, though, are choosing to commemorate the 28th anniversary of his death in a more intimate way. Outside the museum in Saitama, visitors place flowers at a memorial bearing the word Imagine. And most take a few moments of silence to remember the man they think of as their closest English friend.